A tall, agile midfielder capable of winning plenty of the ball, Danny Noonan was one of a number of recruits who helped usher in Clarence’s ‘Golden Era’ of the mid-to-late 1990’s. Born in Victoria in 1968, Danny Noonan was taken as a zone selection by Carlton aged 17 in 1986. Over the next four years Noonan made his way up the ranks at the Blues, however was unable to break through for a senior game and was delisted at the end of 1989 when the VFL required senior list sizes to be wound back. Upon his delisting, the now 21-year old Noonan – who had played predominantly as defender for Carlton – was recruited by TFL side Clarence, who were desperately seeking some talent to rebuild their list after two lean seasons. Noonan’s impact was immediate and significant, winning the club’s Best and Fairest award as the Roos stormed to the minor premiership, only to fall out of the finals in straight sets. He also represented his adopted state in the famous win over Victoria at North Hobart, being named one of his state’s best players. At season’s end Noonan was selected by the Brisbane Bears with the second pick in a sort of ‘Draft before the Draft’ exclusively for the non-Victorian sides. Noonan made his debut for the Bears in Round 3, 1991. In a poor Brisbane side he was a standout performer, averaging 22.6 disposals a game in his 17 games, second only to Michael McLean’s 26.7. Noonan’s 1992 season was even better, playing every game (the only Bear to do so), leading the club for disposals (503) at 22.8 per match, booting 11 goals and finishing equal second in the Best and Fairest. Noonan’s 1993 season was less prolific however, and after 16 games he returned to Tasmania and to Clarence, who had just won their drought-breaking 1993 premiership under former Sydney rover Steven Wright. Noonan slotted straight back into the Clarence outfit like he had never left, and in 1994 he helped drive the Roos to back-to-back premierships with a big win over New Norfolk; he was also back in the Map Guernsey of Tasmania, representing the state in matches against Richmond and the QAFL during the year. 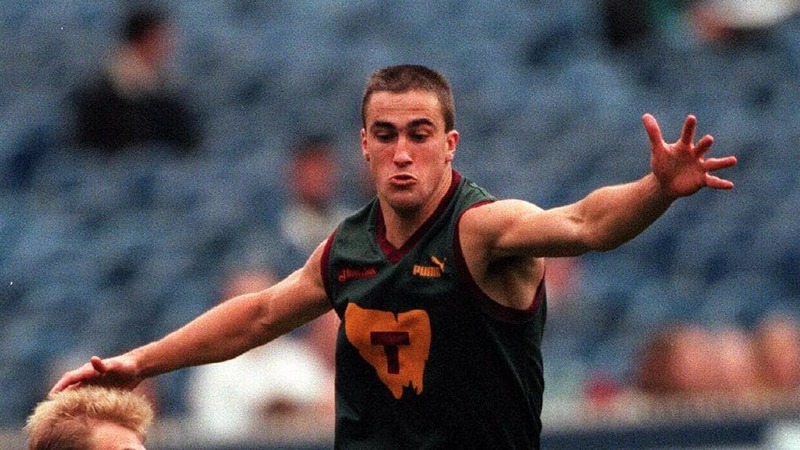 1995-1997 would be the halcyon years of Noonan’s career, a period in which he won almost every individual and team accolade there was to win in Tasmanian football: two premierships (1996-97), two William Leitch Medals for Best and Fairest player in the state (1995-96), two Clarence Best and Fairests (1996-97) and was member of two famous Tasmanian interstate wins against the SANFL in 1995 – in which he won the Lefroy Medal as his state’s best player – and the VFL in 1996. His reputation as the finest player in Tasmania was indisputable, which made his announcement at the end of 1997 that he was retiring and relocating to Queensland for family reasons all the more stunning. He went out on the highest possible note: with a third premiership at Clarence, his job on Burnie star Peter German earning him the Darrel Baldock Medal as Best Afield. After four years in Queensland, Noonan was coaxed out of retirement in 2002 by former teammate and now Dodges Ferry coach David “Moose” Lewis. Even aged 33 Noonan showed with the Sharks that he had lost none of his class, taking out the Hodgman Medal by 10 votes as the Best and Fairest player in the SFL Regional League. That same year he was selected on a wing in Clarence’s Greatest Team, and he retired permanently at the end of 2003.